A journey to the fantasy world of White Snake shall be experience in the latest set of HD photos from the upcoming Chinese anime film which is slated for release on December 21, 2018 on China. The upcoming anime movie is a joint project of Beijing-based Light Chaser Animation and Warner Bros. 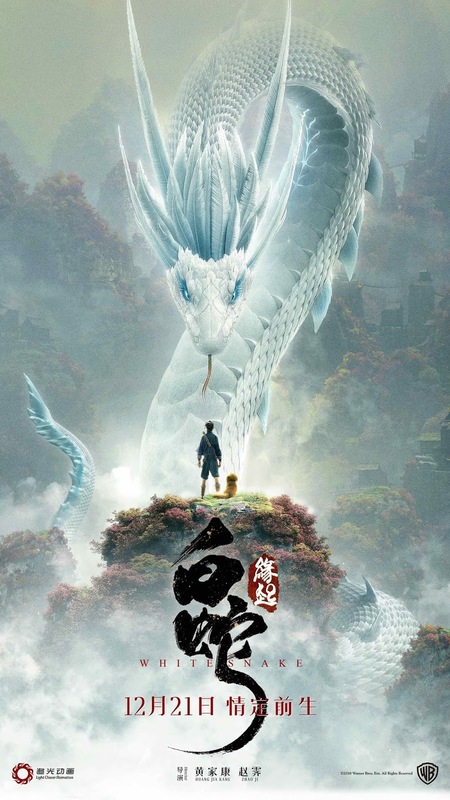 If the movie titled rings a bell, I'm sure you won't be surprised if White Snake is based on a popular Chinese folktale "The Legend of White Snake" - about a spirit of a thousand year old snake-demon and a human who fell in love with each other and embark on a journey of facing insurmountable adversities to prove that a loving relationship could sprung from two beings of different kinds. The most famous adaptation of this story is Jet Li's 2011 live-action film titled "The Sorcerer and the White Snake". What makes White Snake - the animated movie special is that it tells the story of the White Snake before she meet her human lover. The mature tone of the movie generally target the young adults and teenagers as the main audiences. Now, let's take a glimpse at some of the most fascinating scenes from White Snake and be enticed to see this magical adventure. Does this HD images of White Snake anime movie isn't enough to entice you to delve deeper into its world? I personally looking forward to see the film as I'd been a big fan of Jet Li's version of The Legend of White Snake, and I couldn't even wait to see this as I am always open for diverse and different kind of adaptation of the same source material. Anyway, what's your thought about the movie in general? Do you think that it justify the story of The Legend of White Snake based on the available image stills and the trailer? Please let us know by leaving a comment below and don't forget to check out White Snake on Chinese theaters on December 21.